If you are convicted at trial in Texas, and you don’t reach an agreement for the sentence, your sentence will be decided after a punishment hearing. What kind of evidence can the State offer at a punishment hearing? During the punishment phase, both the State and defense may offer evidence as to “any matter the court deems relevant to sentencing,” including the circumstances of the offense for which he is charged. See TEX. CODE CRIM. PROC. ANN. art. 37.07, § 3(a)(1). Relevancy, in the context of punishment, is different than that contemplated by Texas Rule of Evidence 401 because, unlike the guilt/innocence phase where “facts of consequence” are narrowly drawn by the applicable statutes, there are no discrete factual issues to be determined at punishment. See Rogers v. State, 991 S.W.2d 263, 265 (Tex. Crim. App. 1999). Determining what is relevant then should be a question of what is helpful to the jury in determining the appropriate sentence for a particular defendant in a particular case. Id. If you are facing a felony DWI trial in Texas, odds are the State will ask the jury to find that your car was used as a “deadly weapon”? If the jury agrees that your car was a deadly weapon and you are sentenced to prison, you eligibility for parole will be limited. You will be required to serve 1/2 your sentence, or a minimum of 2 years before being eligible for parole. It’s an easy trial penalty for the State, which is one of the ways they pressure defendants into taking plea bargains and waiving their right to trial. What is a deadly weapon finding? An affirmative deadly weapon finding is the trier of fact’s express determination that a deadly weapon was actually used or exhibited during the commission of the offense. LaFleur vs. State, 106 S.W.3d 91, 94 (Tex. Crim. App. 2003). Generally, an affirmative finding of a deadly weapon may be made when (1) the indictment includes an allegation of a “deadly weapon,” and the verdict states the defendant is guilty as charged in the indictment, (2) the indictment does not allege “deadly weapon,” but does allege a weapon that is per se a deadly weapon, and the verdict states the defendant is guilty as charged in the indictment, or (3) the jury has affirmatively answered a special charge issue on “deadly weapon” use or exhibition. Polk v. State, 693 S.W.2d 391, 396 (Tex. Crim. App. 1985). If you are in prison for an aggravated offense when are eligible for parole? First, we need to talk about aggravated offenses. What’s an aggravated offense for parole purposes? If you are trying to figure out good time credit for parole purposes it’s important to know about line classes and work time. What is good time credit? Let’s look at the government code. If you are in prison, headed to prison, or have a loved one in prison, it’s important to understand how parole works in Texas. The first thing to understand is who votes to grant parole in Texas. That function is held by the Board of Pardon and Paroles, and the votes take place at their field offices. Each field office has a parole board members, and two commissioners. That makes up the 3 votes on each parole panel. To grant or deny parole it requires 2 votes. Picking up where we left off on speedy trial rights in Texas, there is a 4 part balancing test, part 2 of that test is the reason for the delay. What’s the law on Reason for Delay in Speedy Trial cases? So you are a criminal defendant in Texas, and it’s been a few years since you were arrested, you remember hearing about a “right to speedy trial” and want to know if your case can be dismissed. Maybe, that depends on the trial judge. In Texas, we allow the State to appeal dismissed cases, which is weird, but whatever. Defendants can also appeal a denial of a speedy trial motion to dismiss. So you need to know how an appellate court will review a speedy trial claim. What’s the law on Speedy Trials in Texas? The Sixth Amendment to the U.S. Constitution guarantees the accused in a criminal prosecution the right to a speedy trial. See U.S. CONST. amend. VI. The right to a speedy trial attaches once a person is either arrested or charged. Cantu v. State, 253 S.W.3d 273, 281 (Tex. Crim. App. 2008). A speedy trial claim is analyzed on a case-by-case basis by weighing and balancing the following factors: (1) length of delay, (2) the reason for the delay, (3) the defendant’s assertion of his right, and (4) the prejudice inflicted on the defendant by the delay. Barker v. Wingo, 407 U.S. 514, 530 (1972). These “are related factors, which must be considered together along with any other relevant circumstances.” Zamorano v. State, 84 S.W.3d 643, 648 (Tex. Crim. App. 2002) (citing Barker, 407 U.S. at 533). “No one factor possesses ‘talismanic qualities,’ thus courts must ‘engage in a difficult and sensitive balancing process’ in each individual case.” Id. (quoting Barker, 407 U.S. at 533). When I’m getting a client ready for trial I ask them to write down any notes/questions they have during testimony. One of the most common things I see written down is that a witness is lying, or that a witness told someone else a different story. Witness 1 in a criminal case says that A happened. A week before trial Witness 1 told Person 2 that A didn’t happen, that instead B happened, how can you get that prior inconsistent statement (to Person 2 that B happened) into evidence? Let’s look at Texas Rule of Evidence 613. To be admissible under this rule, a prior statement must be inconsistent with the one given at trial. Madry, 200 S.W.3d at 769 (citing Lopez v. State, 86 S.W.3d 228, 230 (Tex. Crim. App. 2002)). If a party fails to establish the required predicate, the trial court should sustain an objection to extrinsic proof of the prior inconsistent statement. Id. (citing Ferguson v. State, 97 S.W.3d 293, 296 (Tex. App.—Houston [14th Dist.] 2003, pet. ref’d)). When you make the mistake of talking to the police, or a detective, anyone from law enforcement, you take the risk that the statements you make will be used against you in court. Unless you are in custody, or subject to custodial interrogation, the may not have to Mirandize you or warn you about your right to remain silent. If you just start taking, then what you say is fair game in court. It’s why you should never talk to the police or a detective, and instead hire a lawyer to talk for you. 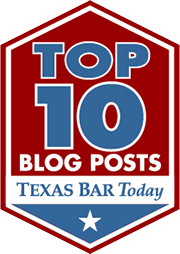 What’s the law in Texas on using a defendant’s statements against him/her? If you are going to appeal a conviction on speedy trial ground, you need to know the law in Texas regarding speedy trials. Texas courts employ a balancing-test, which usually ends up balancing away your right to a speedy trial. “The Sixth Amendment guarantees a defendant in a criminal prosecution the right to a speedy trial.” Hopper v. State, 520 S.W.3d 915, 923 (Tex. Crim. App. 2017) (citing U.S. CONST. amend. VI); see Barker v. Wingo, 407 U.S. 514, 515 (1972). The right to a speedy trial cannot be quantified in days or months. Barker, 407 U.S. at 523; see State v. Davis, 549 S.W.3d 688, 697 (Tex. App.—Austin 2017, no pet.). Thus, Texas courts “analyze federal constitutional speedy trial claims ‘on an ad hoc basis’ by weighing and then balancing the four Barker v. Wingo factors.” Cantu v. State, 253 S.W.3d 273, 280 (Tex. Crim. App. 2008).